Day of the Dead Mexican Tiles available now! Mexican Tile Designs has a full collection of authentic Mexican Day of the Dead tiles! These tiles are raised-relief, colorful designs on a black background and include skeletons playing baseball, skeletons playing basketball, skeletons playing cards, skeletons drinking beer, skeletons dancing, mountaineer skeletons, a doctor skeleton, a skeleton bride and groom, and many more including several decorated skull tiles! Please check out our Day of the Dead tile page ! We are actively growing our collection ! Please call us at 1-866-320-1628 or email us at info@mexicantiledesigns.com and let us know if you are looking for a specific design! 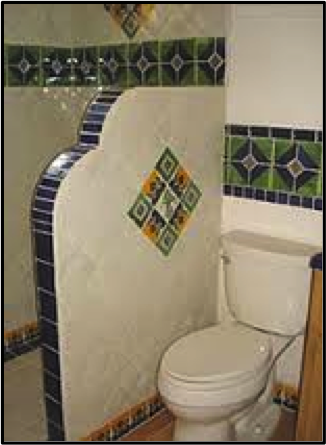 Remodel your Shower with Mexican Tile! There’s something about showering in a bright, beautiful shower that makes you want to sing and starts your day off right! 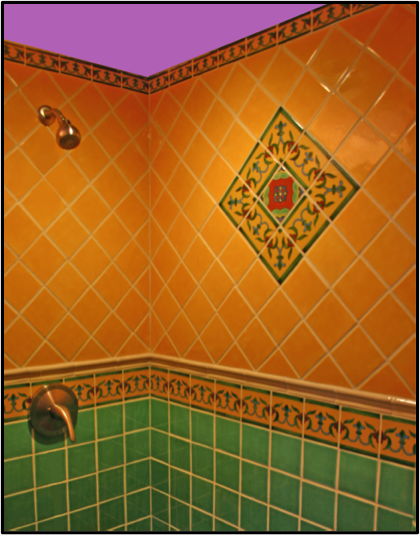 Hand-painted Mexican ceramic tiles from Mexican Tile Designs can help you affordably create a totally unique and gorgeous space that defines your bathroom. Here are a couple of examples from the simple to the wild! As you can see, you are only limited by your own imagination. But if that does limit you, we at Mexican Tile Designs are happy to help you with a Mexican tile shower design! Just give us a call toll free at 1.866.320.1628. One way to begin is to choose your solid color Especial Mexican tile for the background. Although, if you find a decorative Especial Mexican ceramic tile or Especial ceramic border tile you love, you can easily find a solid color or colors to match it. 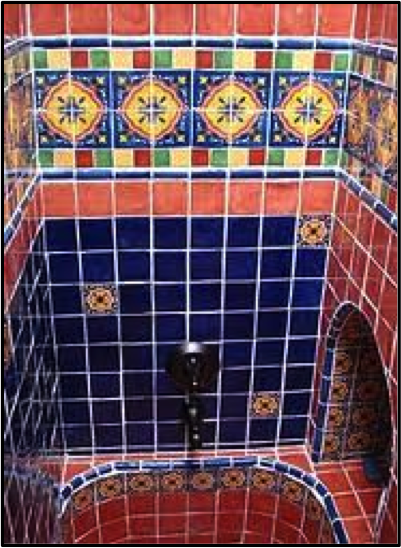 At Mexican Tile Designs, all three of our hand-crafted, hand-painted ceramic Spanish tile lines are suitable for showers: Traditional rustic Mexican tile, Especial premium ceramic tile, and Prima raised-relief Malibu-style tile. Take a look at our website and peruse all three hand-crafted tile lines, our huge selection of Mexican-style ceramic sinks, and our Mexican tile murals to get your own design ideas for creating a new, beautiful bathroom!